Add the potatoes to a large sheet pan with sides. Drizzle the potatoes with olive oil. Add the seasoned salt, pepper, garlic and lemon zest. Toss well. Roast for 10 minutes or until you are ready to add the chicken to the pan. Meanwhile, prepare the chicken. Place walnuts, basil and garlic in food processor and slowly add the olive oil until mixture becomes paste like. Add Brie, cream cheese and egg to the food processor and pulse until mixed well. Season with salt and pepper. Gently pull up skin from chicken breasts and spread about 1-2 tablespoons (depending on the size of your chicken) of cheese mixture under skin of each breast. Remove the potatoes from the oven and slide them around a bit to make room for the chicken. Place the chicken on the pan. In a bowl, combine the apricot preserves, balsamic and 1-tablespoon olive oil. Brush the mixture all over the chicken breasts. Place the pan back in the oven and roast for 30-40 minutes or until the chicken is cooked through and the potatoes golden. If the potatoes are cooking faster than the chicken, just remove them a bit early to avoid burning. 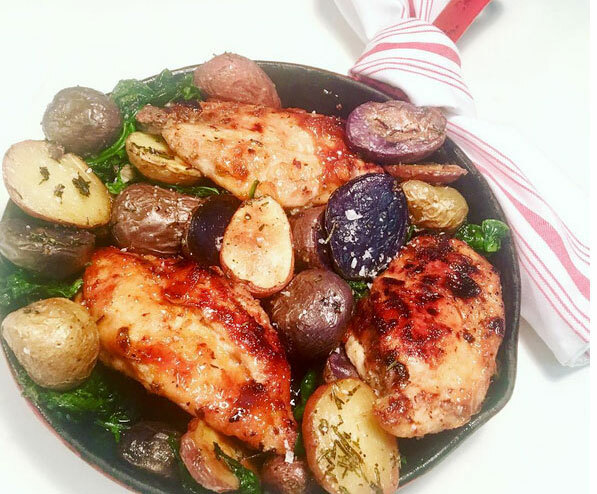 Serve the chicken with a side of potatoes and fresh basil for garnish.